F is a Christmas friend. By that I mean, she and her husband, P, are people that my husband and I worked with in the mid-seventies, and with whom we've been in touch ever since -- generally once a year, at Christmas. Of the two of us, F was the less conservative, the more feminist, and the more inclined to make her own cards, while I steered away from tree-hugging and bought my cards by the box from UNICEF or got them sent to me by some other charitable organization(s). F usually included some sort of newsletter; I wrote short notes by hand. When our kids were small, we visited them and their (still small but a bit older) kids in their home on Vancouver Island, but they never got around to visiting us in Calgary...and now all said kids are grown, and some are married, and some have children of their own. Still, F and I (it's usually the women in families who do these things, right? Act as Social Secretaries and Perpetual Correspondents...) continue to correspond at Christmas. So. This year, I sent my usual card and hand-written note to F and P -- and very shortly before Christmas got an e-mail from F with the usual newsletter attached. But...the word cancer leapt off the page screen at me, and I printed it out, just to be sure. Then I phoned. 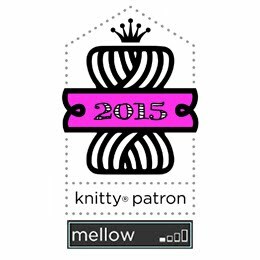 After I hung up, I found a pattern and began to knit. I finished it Saturday (Jan. 5), had it blessed by our priest on Sunday, and it's in the mail now. 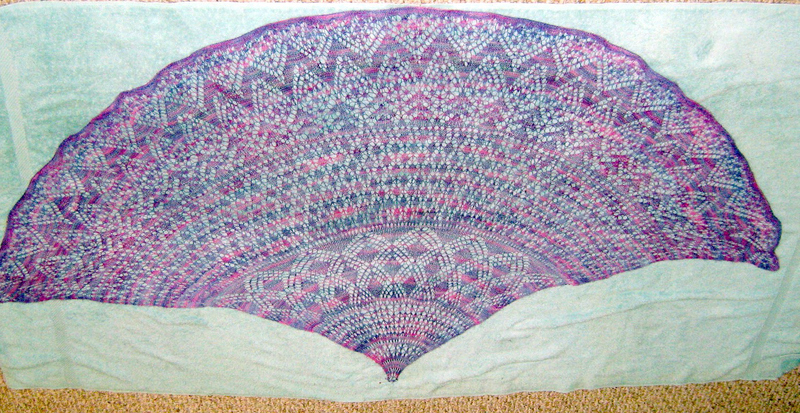 While I was blocking 'Zilver', I dug out a shawl I'd knit from a set of mystery clues on Ravelry a while back. I was never happy with it, so I decided to wash and re-block it. Yes, folks, this can be done! And whoa! Ir's larger and lovelier -- much more as I'm sure it was intended to be! What a difference a little learning makes! I'm much happier with the 'after', which is larger and actually wearable! As for blocks, I'm making my way gradually along Easy Street, having completed nine of sixteen Blocks "A". I hafta tell ya, I'm simply lovin' these colours!! And I'm keeping a promise I made to myself when I was digging through my stash for ES fabrics. At that time I found three (count 'em) bags of Blocks-of-the-Month I'd purchased as far back as 2003 from a quilt shop in Calgary that (alas) has since closed its doors (owner retired). I hadn't (really) forgotten 'em; I'd just not got around to working on 'em. So... 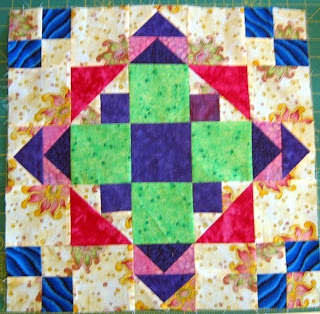 I promised myself that starting January 2013 I'd begin to put them together...figuring on at least one block per month for three years, resulting in 3 small tops to quilt up and give away. 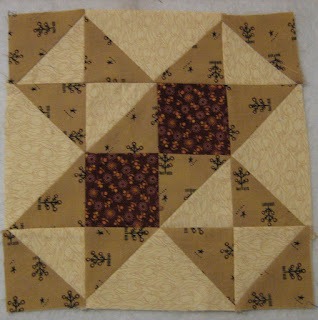 The first quilt top I chose is called "Cinnamon" and dates from 2006. Here's the January block, which is 10.5 inches; 10 inches finished (in the quilt). 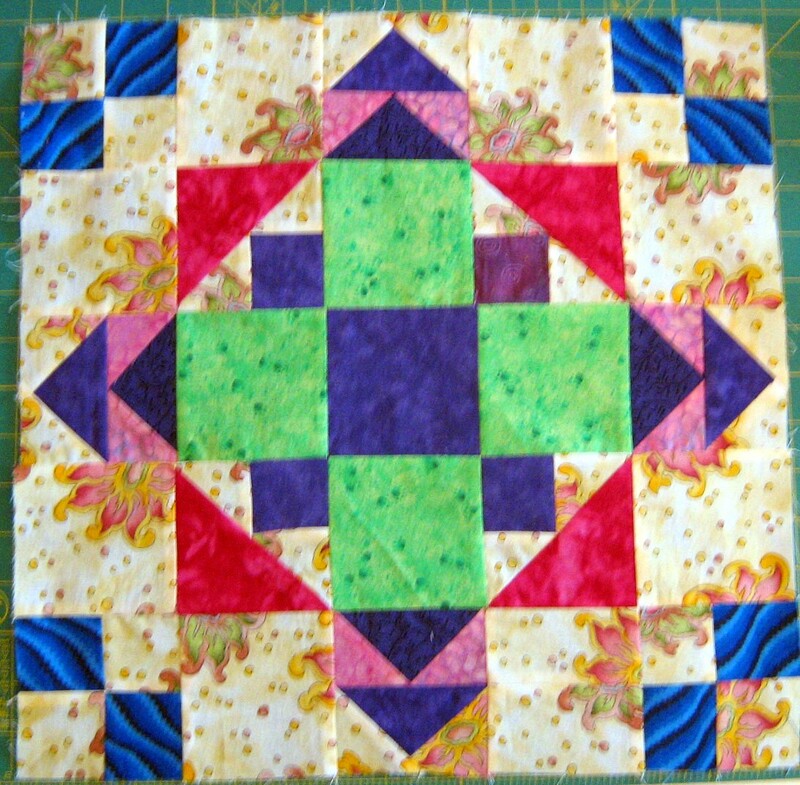 Likely there'll be sashing so that the 12 blocks can make up a throw- sized quilt at the very least. The shop owner, Janet, was fond of stars it seems, because most of the Saturday Block and other BOM programs she ran consisted of stars in various configurations! I don't mind, because it keeps me practicing my piecing and my points! I may do one BOM this year, or I may do two. Whatever happens, at least one top will be ready to quilt by year's end, and it'll be small enough I can manage it here at home. That said, tomorrow it's back to work in earnest in the art quilting 'sewdio', so I'll be working on blocks betwixt and between. I have some stories to tell about trees...so stay tuned. I'm sorry to hear about your friend's cancer. I'm sure the shawl will be a comfort to her. Your Easy Street block looks great! your easy street color choices are wonderful! Love your colors for Easy Street...will be watching for it to go together. Your Easy Street is looking great. I had breast cancer 3.5 years ago and my friend knitted me a shawl - it was very comforting and I'm sure your friend will love her beautiful shawl.